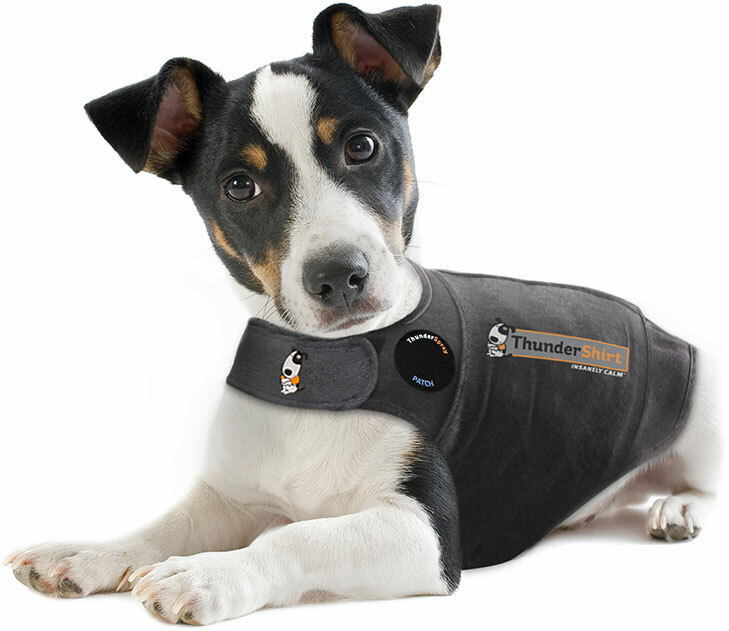 The Thunder shirt is a patented design which applies gentle, constant pressure on a dog’s torso, and this pressure has an amazing calming effect for most dogs. Use for symptoms including panting, drooling, shaking, barking/whining, hiding, scratching, licking, seizures, inside mistakes. Pressure has been used to successfully reduce anxiety for many for many years for both animals and humans. Examples include parents swaddling infants, veterinarians using squeeze chutes when vaccinating cattle, and thousands of people with autism using pressure to relieve persistent anxiety. Thunder shirts are also highly effective for thunder, fireworks, separation anxiety, leash pulling, car and air travel, barking and licking. Thunder shirts are designed to be safe to leave on for extended periods of time when appropriate for the situation or issue. When properly sized and properly put on with a comfortably snug fit, your dog should be very comfortable. If your dog will be wearing a Thunder shirt for more than 2 hours at a time, we recommend removing Thunder shirt every one to two hours during the initial periods to check for any signs of irritation points. Irritation points are very rare, but it is best to be cautious.